For months, I've been meaning to make a shrug with this lovely white wool acrylic blend with lovely flecks of pink and blue in it, from New Zealand which my mother gave me. It's the perfect colour to go with the dress I wore when I got married, but there were only 4 small balls of it. The design of the shrug would have to make economical use of the small amount of yarn, because I knew I needed something with sleeves down to my elbows so I could wear the dress in cooler months. I put a lot of thought into the design of this shrug. Like I said, I didn't have much yarn to throw around. The amount of yarn I had would determined the length of the sleeves. So I started at the middle of the back, starting in the direction of one sleeve. I started with a chain and a row of sc, then straight into the shell stitch, which is a pretty common stitch, but I was inspired by this photo of a scarf on pinterest. Using a 5mm hook complimented the yarn and this stitch quite nicely. I also started with the seam at the middle of the back so that the shell stitch would be symmetrical. In the first shrug I made, which followed a pattern I purchased from Lincraft, the lace stitch went in one direction, starting at one wrist and ending at the other, so it wasn't symmetrical. I didn't quite like that, although it was easy to make. I used up the first two balls of yarn making the section that covers the back from shoulder to shoulder, starting at that middle seam. Then I considered the collar. I knew I wanted a collar, but wasn't sure what a few rows would look like, as I haven't made a shrug like this with a collar before. I couldn't spend too much yarn on the collar though, so opted for just one round of the same shell stitch as the main part, which I think looks quite tidy. I used the 4th ball for one sleeve, and the rest of the 3rd ball for the other, and fooled around with the cuffs for quite a while. In the end, I decided on a slight flair at the cuff, although I did consider a tighter cuff of simple rows of dc. I joined the left over 4th ball to the shorter 3rd. The cuffs are simply three rounds of (3 dc 1 ch 3 dc, dc), when the main shell pattern was (2 dc 1 ch 2 dc, dc). I did try wider flairs but I thought they just looked silly. 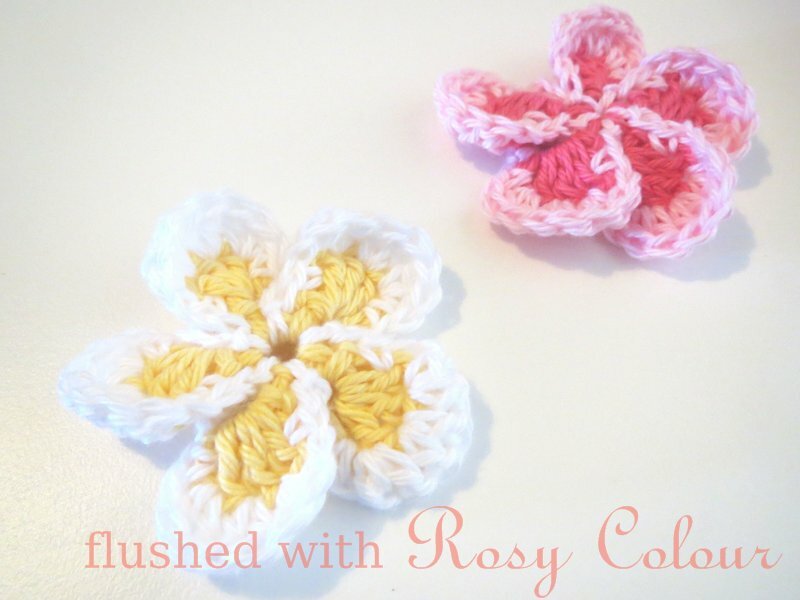 I used almost all of the yarn, with the tiny bit left I made a new flower and put it on a brooch. I think I'll give it to my mother, she might like it. After all, she did give me the yarn!